An experience for the craft beer enthusiast unlike any other. Grand Rapids Beer Tours illustrates why Grand Rapids, Michigan is “Beer City U.S.A” by immersing you into beer culture, beer history and beer tastings. 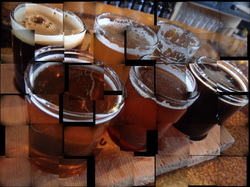 What we offer is an enjoyable and educational way to sample beers at various craft breweries. 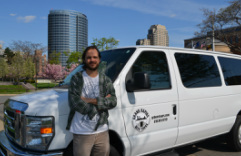 We supply customers with a safe ride to and from different breweries in the West Michigan area in a 15-passenger tour van. The demand to experience breweries in the Grand Rapids area is on a steep rise. Two years in a row Grand Rapids has been voted “Beer City U.S.A”. People flock from all over the country to sample beers made in the city that Lonely Planet named the #1 US travel destination in 2014. This is not just a taxi service! Our intimate guided tours offer guests knowledge about the variety of beer stylings and a little about the history of beer in and out of Grand Rapids. On every public tour we will take you behind the scenes where the beer is created at one of the brewery stops and learn about the process of beer making. Also to be noted, every public tour includes all of the beer samples! Want to book a private tour? No problem. Private tours are great for corporate/convention visitors, work parties, birthday parties, bachelor/bachelorette parties, fundraisers and charities or maybe you just want to get some friends together and taste a variety of craft beers and don't want to be responsible for driving. While we are largely focused on the Grand Rapids beer scene, we also offer private tours that can stay on the regular routes or go to any beer destination in the great state of Michigan, you make the call. Owner/Tour Guide, home-brewer, and native Grand Rapidian, Brian Haik started Grand Rapids Beer Tours with the hope to bring the beer community a unique experience with responsible transportation to a variety of Beer City breweries (from the big guys to the little known hideaways). He loves to try a variety of craft beers straight from the source, he has personally gone to every brewery on the tours & he can't wait to share his research with others. "Sure I can go to a store and pick up some bottles of Odd Side Ales or cans of Brewery Vivant, but you don't get to experience the true essence of the brewery unless you go straight to the source. Plus there are a number of limited beers on tap at these breweries that you can never get from the stores." While preparing to graduate from Grand Valley State University with degrees in History & Geography, Brian started working at Founders Brewing Company. He had a diverse career at Founders. For two years Brian worked as a doorman, bar-back, & food expo. But, he has been immersed in Founders' culture for over fifteen years as a musician & patron. 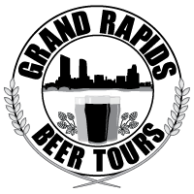 Through Founders' Cicerone program he became a Certified Beer Server (educated in Beerology). Because of his experience at Founders & his passion for beer he decided it was time for himself to dabble in the beer business. By taking beer lovers on guided tours he can share all of his beer knowledge & enthusiasm for Grand Rapids/Brewery history . "I always enjoy going to a variety of craft breweries, but I sure don't want to drive afterwards. Also I like to know the history of the breweries. I put it upon myself to start a business that gives people a safe way to travel to different breweries and learn about the beer and the breweries themselves. Beer is a science (Zymurgy) and the process is very interesting. I want to see people laugh and have a great time on these tours, but I also want to educate them and make them look at beer in a different way." Brian has taught a Grand Rapids Beer History class for Kent District Library. He is also a Certified Travel Ambassador of Grand Rapids.